I went viral. That’s good, right? I recently posted a pile of photos to imgur which totally went wild and spun out of control in the best way possible. I had posted as my obsession, that “ramen is life” and the internet took and and ran with it. Having never done anything that had been seen by more than a few dozen people it was exciting to see the results of posting a volume of work online. It was viewed well over 100,000 times over the next few days. Neat. I had a blast seeing all the questions and answering when I could. I am sure people noticed a lot more than I meant to share. There were comments all across the board, from the background items, the bowls, the ramen components, and of course what could be gleaned about me, Jay Radam. My weight, my ethnicity, my weight, my obsession with eggs, my weight, my job that allows for such time-consuming lunches (and breakfasts). The majority of the photos were made to burn up the leftovers from a ramen party. Honestly, the whole thing was a mistake brought on by my inepttude at new social media things beyond MySpace. 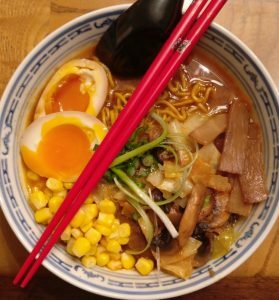 I had created the post about the ramen party so long ago; the only change was making it public. The original post can be seen here.